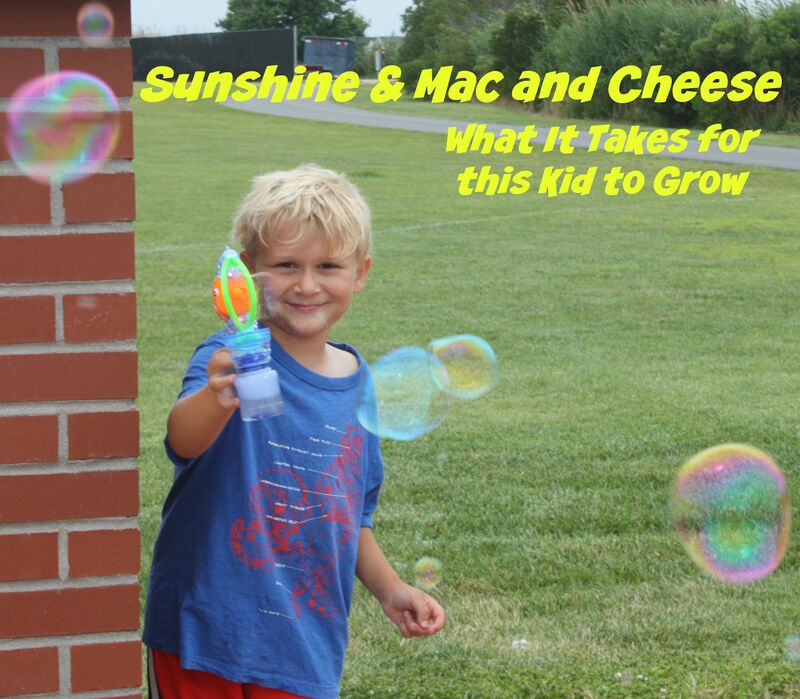 “Sunshine and mac and cheese.” That was my response to a friend that hasn’t seen my son in a few months and was shocked to see how he’s recently shot up in height. All I could say is “It must be sunshine and mac and cheese because that’s all this kid needs to grow.” The truth is, my boy should be a shade of orange because his diet consists mainly of orange colored food: mac and cheese, chicken nuggets, and cheese sticks. I’ve never really considered Aaron a picky eater because when given the foods he likes, he eats really well, is super healthy, and he is a so tall. However, when his little sister came along and was willing to eat anything we put in front of her, I realized this guy is a little tougher at meal time than I realized. Is there anything that makes a Mamma’s heart sing more than seeing her kids eat well? No one wants to fight with their kids every single mealtime. Ugh, no thank. My mission this summer is to get creative, keep the peace, get this boy to try some new foods, and to show him a veggie will kill him. With our free schedules during this easy breezy summer and tons of fresh fruits and veggies available right now, it was time to change the way we eat. Here’s what were are doing in this house to get a little more adventurous with our eating. Try It Tuesday and New Food Friday- Everyone gets something new on their plates on these days and we have to try at least three bites. Even Mom and Dad. We make it a game and then celebrate when we all take at least three bites. Small scoops- When we’re trying new foods, we start with tiny bites. So rather than dumping a pile of peas on his plate, I give him two or three. Imagine being a kid and your mom is making you try new food and there is a mountain of green stuff that looks and smells sketchy. However, two or three green things, not so bad. Hide It- You think that’s just pizza right? (Insert Evil Laugh) I added pureded spinach! I have to be creative and sneaky and this does take a lot more planning, but the blender is getting lots of use and I feel better knowing there is zucchini in his blueberry muffins. Smoothie Season- The kids think they’re getting a sweet treat, but this mom has packed a smoothie full of greens he would turn up his nose too. All he tastes is his favorite fruit, blueberries! Week By Week- My pediatrician gave me this tip when I was feeling like my attempts to get my boy to eat new foods and veggies was failing. She suggested rather than look at every meal, every single day, look at the week and pat yourself on the back for trying new foods and veggies a few times a week. Vitamins are essential for good health through every stage of life. Our bodies require a broad variety of vitamins and minerals to function properly, yet it can be challenging to get all the nutrients we need from food alone. And believe it or not, a kid can not survive alone on sunshine and mac and cheese. We all strive to maintain a healthy lifestyle for our entire family. We know the importance of a balanced diet and exercise but for many of us, we can continue to rely on vitamins and minerals to fill nutritional gaps and enhance health. Did you know that kids tend to gain MORE weight in the summer months? Considering my kids seem to be busy every single minute of a summer day, this statistic shocked me; however, check out this graphic from Know Your OTCS to see why this is true. Looking for more information about dietary supplements for you and your family? Know Your OTCs created a really helpful site that can answer a lot of your questions. What are your tips or tricks to dealing with picky eaters? My little man WILL NOT try new foods. It is so frustrating, especially since his big brother will eat pretty much anything. It was pretty simple in my house growing up. If you didn’t eat what was on the plate in front of you, you went hungry. Eventually I learned to eat it and appreciate it. We do a “no thank you taste” in our house. After awhile they learn they actually like whatever it was we were trying to get them to eat in the first place. WOW the stats in the infographic are interesting and startling – the weight gain over the summer, too, in our kids. New food FRIDAY. That is AMAZING. What a great idea. I need to try this with my oldest. He refuses to try anything new! I like the idea of mixing the healthier foods in with their favorites. Smoothies are a great way to do just that. I love the way that you have to getting your little one to eat veggies. I actually played the hide it game a lot when my kids were small. Totally can see how kids gain weight in the summer. They are home all day and want to eat, eat, eat! If they don’t have enough physical activity, they will gain weight. We try to offer a variety of foods so that they can make choices. Raw veggies and dip are a big favorite in my house. Some of my kids are better than others. I make them at LEAST TRY a bite before they tell me they don’t like it.